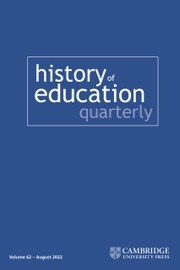 The History of Education Quarterly is an international, peer-reviewed academic journal dedicated to publishing high-quality scholarship on the history of education. It is the official journal of the field's leading professional society in the United States, the History of Education Society, and has been published continuously since 1960. The journal encourages submissions from a range of intersecting sub-fields in social, political, economic, intellectual, and cultural history, including (but not limited to): Urban History, Policy History, Sociology of Knowledge, Colonialism and Colonial Education, History of Childhood and Youth, Gender Studies, Ethnic History, Indigenous Education, Cultural Studies, Comparative History, and the History of Ideas. Individuality, Freedom, and Community: Ella Flagg Young's Quest for Empowered Teachers - View Jackie Blount's 2017 History of Education Society Conference Presidential Address below.